A couple of weeks ago, I went to the Akron Music Fest at the Summit Artspace in downtown Akron. It was 12 hour event featuring more than 20 local musicians. I only stayed for a few hours so I only caught four of the bands. 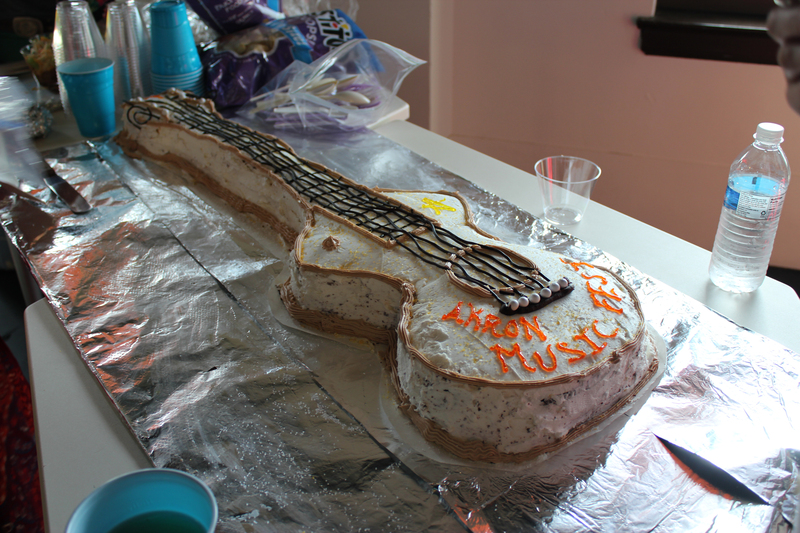 In addition to music, there was also beer, snacks, and cake. Yes, cake will always have its own category. But can you blame me? Just look at it. I arrived when one of my local favorites hit the stage, The Daniel Rylander Trio. If you don’t know by now, Daniel is a 21-year-old singer/songwriter who just released his debut album, Strawberry Skyline, last September. At the event, he was joined by his guitarist, Stephen Melfi, and percussionist, Stephen Rylander. They were probably my favorite who played that day. Then again I’m kind of biased. I should really get around to reviewing his album soon. Next up was Anchor the Moon. I had heard this band’s name before and I had actually met the lead singer on multiple occasions without having even knowing it. They have a bluesy, hard rock sound to them that is interesting. The lead singer portrays himself as incredibly unstable which is really funny and he turns bright red when he sings. I’m curious to hear their recorded work. I’ll have to check it out and get back to you guys with a full review. Time Cat hit the stage right after. They actually just released an album a few weeks ago. I ended up missing the release show due to other obligations. Although, I liked their sound well enough, I felt like something was missing. I still can’t put my finger on it. I’ll have to check out their new album to give a more adequate opinion. Recipe of Life was the last group that I heard. They originated from Stow, OH. I’ve seen the name floating around at a couple of events I’ve been to, but I’d never heard them play. Shelby, one of the members, sometimes sings with Daniel. I believe she played with him the very first time I heard him at Musica. Anyway, Recipe of Life is a blend of pop and folk. They harmonize very well and have beautiful voices. Their songs are very happy and upbeat. This is evident in the group of people who got up to dance. A bunch of guys even grabbed some percussion instruments and played along. It was pretty cool to witness. Overall, it was a good day. I got to hear three new bands and hang out with some pretty cool, new people. Am I now becoming a people person?! I wouldn’t go that far, but there’s something about good music that brings out the best in people.